Welcome Home, originally uploaded by Ben Mason. This is what I came home tonight. Brrr! I wish I had tomorrow off of work! 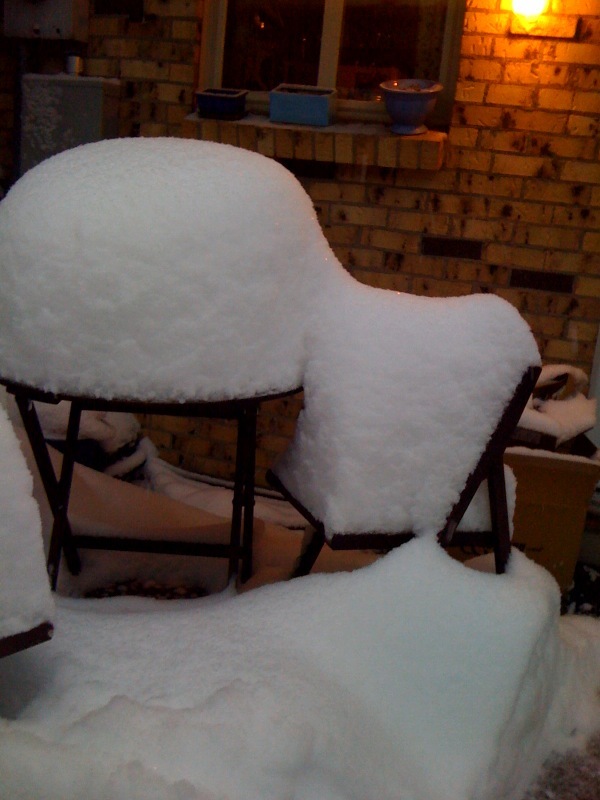 It was no fair having to go in today when everyone else in Denver got to stay home. What a grand day to have off from work! I woke up at 6 am and promptly turned off my pager, no longer on duty. Then I went back to sleep 🙂 Later I made pancakes for breakfast, and shared them with my dear husband who was working from home. You see, when we got up there was already 3 inches of snow, with much more forecast. We took Jem to daycare so she would get plenty of exercise despite the cold. Also, we could have an undisturbed day of coming and going from the house with her out of it. I haven’t taken her to daycare in a long time and gee whiz, I thought she was going to stroke out on excitement. She starts running around the backseat, whimpering and clawing at the window, getting more and more exacerbated the closer you get. She DEFINITELY knows the route there. To give him time to work undisturbed, I slowly shopped around Target, one of my favorite suburban pastimes. I needed some Halloween candy, stat! I also called my sister who is shacked up in the mountains, hopefully having a relaxing time. Then I got a peppermint hot chocolate at Starbucks and chatted with my mom, watching the snow fall in heavy clumps. At home I met up with Ben and we walked down the block to the local Chinese restaurant. I love eating lunch out with Ben, and I love hot egg drop soup and rice with soy sauce on cold days. It was quite a trek to get there actually. The snow was knee deep in places on the way back. We passed a group of snowboarders on the sidewalk. They had built a ramp of snow at the top of a set of stairs down the hill. The stairs have a long, shallow rail running down it. They also hooked a bungee cord to the railing. They would bungee up the snow ramp, then jump on the railing with their snow boards, ride it down the hill, falling off onto the snow banks when they lost balance. Very clever. Shelley Duvall’s Faerie Tale Theatre! Holy crap this is a treasure. Did anyone else watch this when they were kids? It was on Showtime in the 80s, then picked up for syndication by the Disney Channel and PBS. I selected Snow White to watch. What. a. cast. First, we have Vincent Price as the mirror. With his face is painted like wood and stuck in the wall, he provides droll narration. Then Vanessa Redgrave plays the queen. I kid you not, she has red crimped hair frizzed out and wanders around waving her arms, draped in teal and purple velor. Fabulous. When she dies of vanity at the end she actually sticks her tongue out to make goofy gaggy noises while rolling on the floor. Fantastic. Finally, the singing prince is none other than my beloved Rex Smith! One year after his world debut in the Pirates of Penzance film, he’s back! Singing! In thigh high leather boots! Oh, be still my heart. The episode needed a lot less stupid dwarfs and a lot more Rex. So yeah, really good day so far. I’m not feeling the cooking vibe, so at Target I bought ready made frozen lasagna, ready made garlic bread, and salad in a bag. If you know me, you know how weird that is. Ben said “This doesn’t look right” as he was putting the groceries away. I need to find something quick to take to movie club though. Brian has picked a super-Halloweeny treat. It’s the Black Cat, by Edgar Allen Poe, starring Boris Karloff and Bela Lugosi. How great is that? I hope I can watch it all and still get enough sleep for tomorrow when it’s back to work for me. 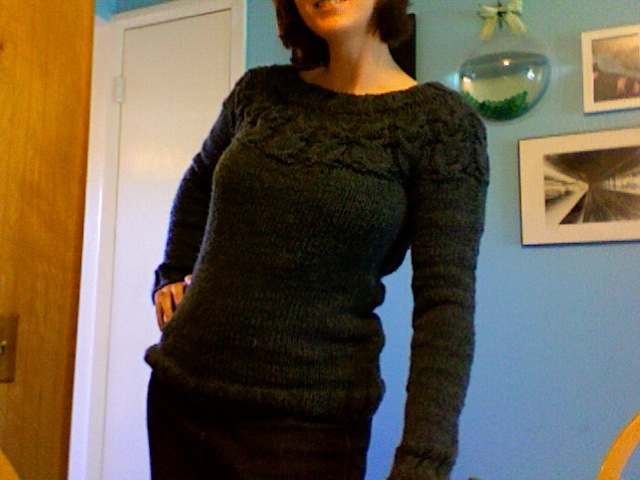 I finally finally finished this sweater. I stopped near the end because summer came, and I didn’t want to not be able to wear it when I finished it. Then I stopped to make a dress for Zaley. The recent snow reminded me that I need to GET ON IT and finish this thing. Ta Da! 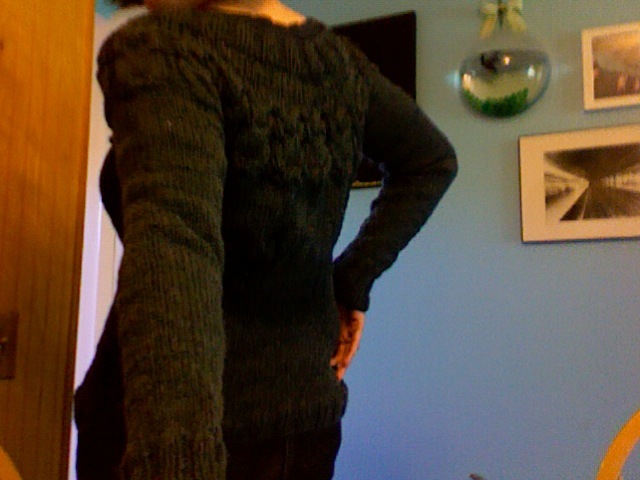 See the owls along the neckline? I need to find buttons to put on their eyes. Then it will be more obvious that they are owls. It’s not a perfect fit. The back sags a little, the collar could come up higher. But it’s my first sweater! The homemade look is ok. I love that on Sundays you get to put on a smart, pretty outfit in the morning, then change into your most comfortable grubbies in the afternoon. Best of both worlds. Holy crap guys, my Emma’s Baubles site has actual traffic. In fact, Instyle.com linked to my site! In a Jayma Mays quote! My dream is that Jayma Mays will discover my site and comment on it. There’s a deli meat advertisement on Hulu.com. I think this kid is Brian circa 1992. 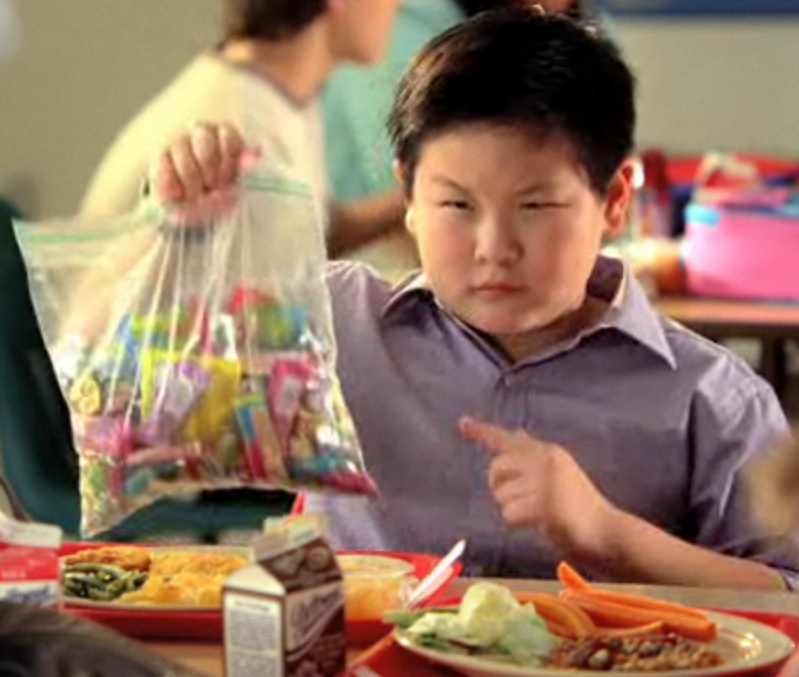 Except Brian would have NEVER forfeited his Halloween candy. Well, maybe for an R-rated movie. But even then . . .